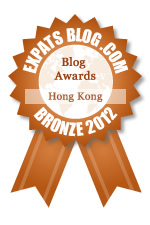 “Eating local” is rather hard in Hong Kong where farmland is limited and population is high. Most food is imported. Much comes from Mainland China, but food scares (melamine in milk, reports high levels of pesticides in some foods, etc) have encouraged some folks to pay a premium for foods that come from further afield. Milk is an interesting example. There is only one dairy farm left in Hong Kong (in the New Territories) and it sells its precious organic, glass pints of milk for a premium at only a few places. All the other milk is imported. Traditional Hong Kong brands, Kowloon Dairy and Trappist, shifted their dairy herds to nearby Guangdong, China (the milk is then imported to Hong Kong for processing and packaging). Lots of milk is imported from further, especially from Australia, New Zealand and even California. 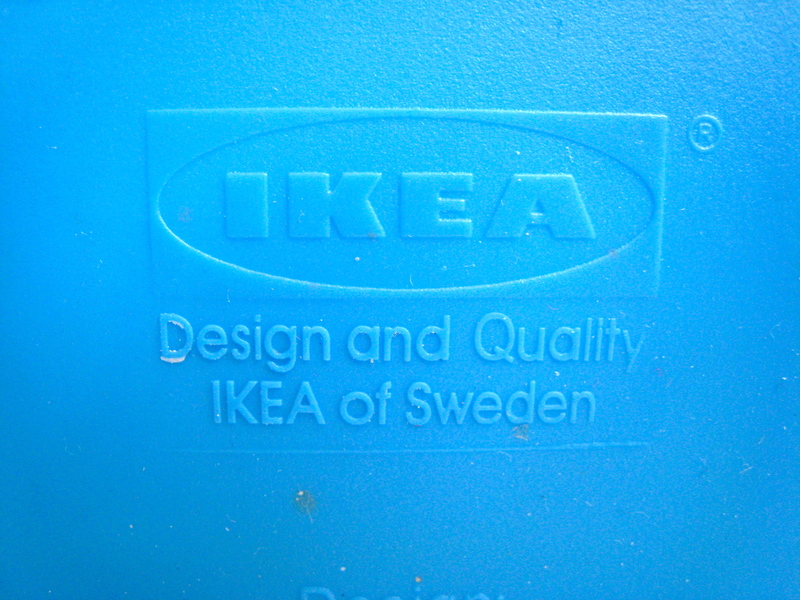 “Safety” and “wholesomeness” is the marketing angle. Australian dairy cows shipped to Indonesia, that is. Why in the world would it matter that the cows–who are currently living and being fed and milked in Indonesia–were originally from Australia? A breathtaking marketing gimmick! Kudos PR team! 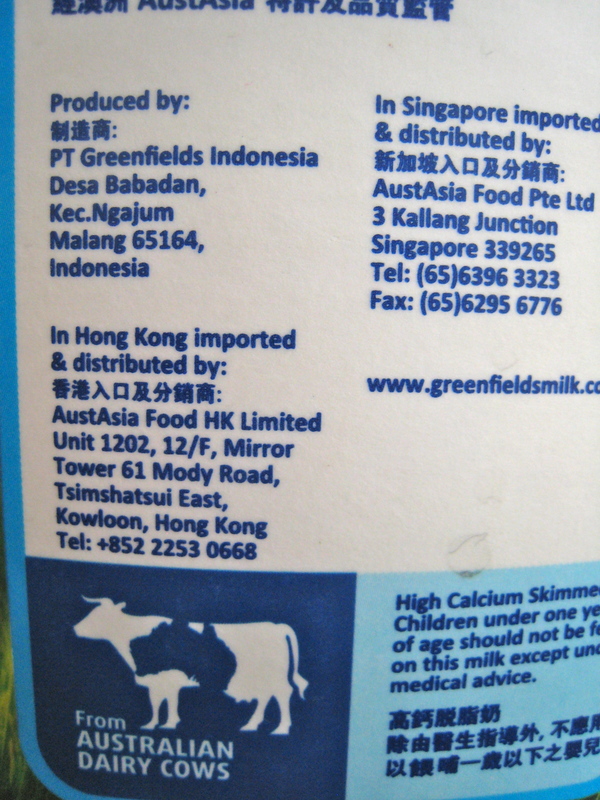 This milk is from “safe” Australian dairy cows on holiday in Malang, Indonesia. However, I’d never seen this kind of marketing machination applied to fresh milk before. 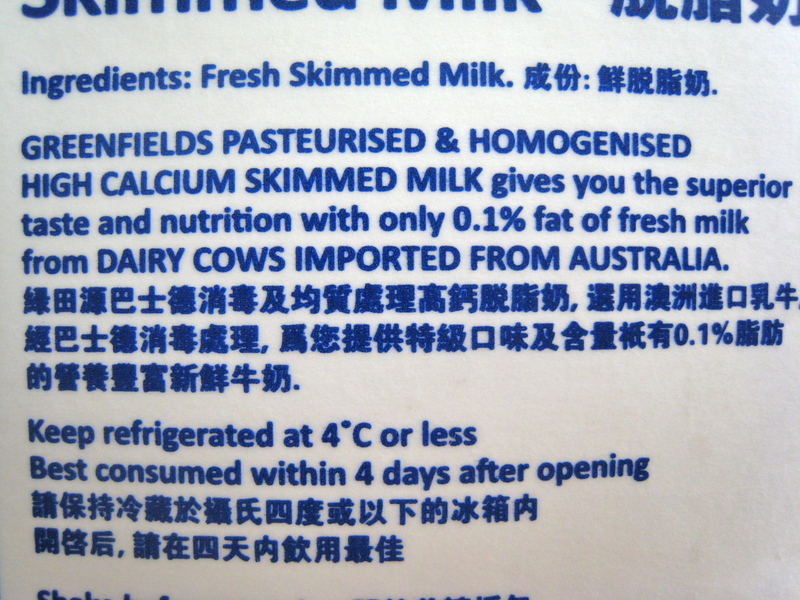 Indonesian milk produced from “dairy cows imported from Australia” is a whole other level of smoke and mirrors. That’s really great. Cows on holiday. 🙂 I struggle with what to eat in Shanghai – there are so many options but prices and quality and taste and storage conditions are so varied. No wonder that almost five years in my stomach has issues eating things I used to consider normal! I feel for you. In Zhuhai, I bought chicken in Justco that had obviously frozen and thawed several times over and saw the local “imported food store” put all its dried pasta out in the sunny parking lot to “re-dry” (after humid weather)! Wow, that’s crazy! Hopefully, the milk is expensive enough so they can afford first class seats for the cows to Indonesia! Living abroad makes you realize how spoilt we all are when it comes to quality and freshness of food (amongst other things), doesn’t it? I also struggle with buying groceries here. A lot of local products just taste very bland, other things are often hard to come by, and you have to read the ingredient lists very carefully. But I have to say that so far, I haven’t read about any cow tourism in Mexico…! Great post! I always thought the labels for dairy products were kind of funny in HK. 2 dairy products I do miss from HK are: 1) the Aloe Vera Emmi yogurt in SMALL containers… the Emmi yogurt sold here in the States tastes different and is packaged in bigger containers. They also don’t sell the Aloe Vera flavor here; and 2) the ginger milk custard from Yee Shun Milk Company in CWB, though I can’t guarantee that the milk is imported from fancy Australian cows!! Ohhh, I’ll have to look for those. Thanks! Sometimes I’m completely overwhelmed by all of the food choices in Hong Kong. For, example which eggs to buy imported from which country and with what animal welfare/safety assurances. I’d been buying Thai eggs for no apparent reason until last week when my daughter fell in love with the white eggs imported from America. I actually miss England’s egg choices–almost everything was local and free range. Maybe I can find eggs laid by English chickens on a free range holiday in Malaysia?